Warm and beautiful May weather at off season spring rates. Please email, text or call for a quote. 180 DEGREE PLUS VIEWS ON THE LARGE BUMP OUT BALCONY. So big you can choose sun or shade. You can also catch a breeze on the outer balcony, or move in for a light breeze. 30 feet of floor to ceiling windows provide a wide and dramatic view of the pool, beach and gulf. Windows and ceiling are 8 ft. high, and run the total width of the master bedroom and the living area. Balcony deep enough to get a tan or cool off in the shade...your choice. Table and 6 chairs make large balcony ideal for sea side dining, watching sunsets or just hanging out. At night, a turtle friendly balcony light extends enjoyment of the balcony, as the pool lights come on and give a beautiful night view of the pool area. Beautiful views as well from the adjoining and gorgeous master bedroom.Bump out bay window gives 180 plus views to east, south an west. A door leading to the balcony gives perfect sunset views, even from the bed. Large master bedroom with large en suite bathroom. Two end tables frame the bed, and their is ample room on both sides of the bed and between the end of the bed and large TV cabinet (with storage). As you walk into the bathroom, you will see a large walk in closet and a vanity with double sinks and cabinets, including a handy medicine cabinet. Moving to the next area, you will see an oval tub and large linen closet. Then you go thru a privacy door leading to the rain shower and commode. The master bathroom is really a suite. The living area also has a direct view of the gulf. The sofa bed, matching recliners and even the table and four chairs also view the gulf. A late model Samsung 43 inch TV is positioned to let you see both the TV and the gulf, at the same time, if you want sensory overload. Dining table and 4 chairs is steps away from the kitchen. The kitchen also has a direct view of the gulf, and the open floor plan lets you talk to the people in the living area, dining area or even see the TV. Upgrade ash cabinets provide lots of storage. Very well equipped, with lots of flatware, dishes, pot and pans and both drinking glasses and wine glasses. Toaster oven and coffee pot included. Dishwasher and microwave, of course. The guest bedroom is in the front of the condo, and a window opens to a view of the golf course. The guest bath opens with doors to both the bedroom and the hallway. 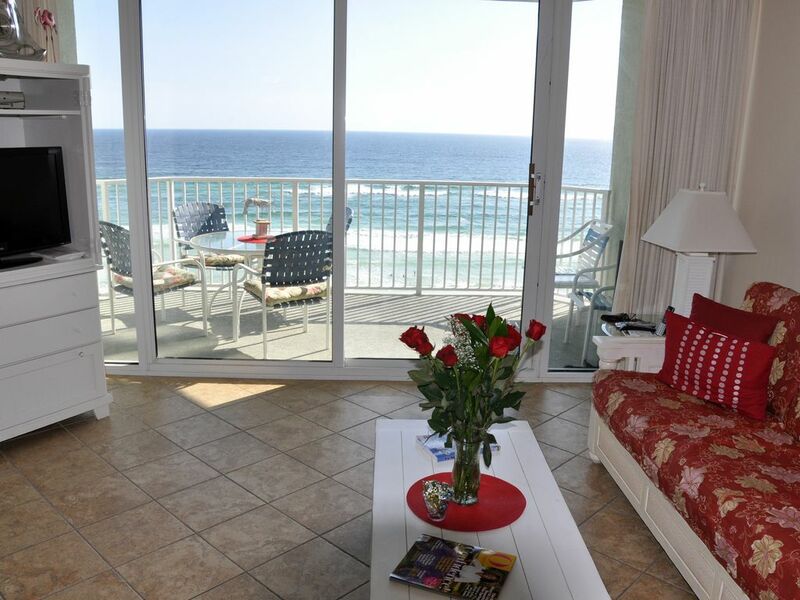 As you enter the condo, you will notice it is wide, and in a few steps you are seeing the beautiful gulf. There is a hall closet on the left, and a washer and dryer room just before you reach the kitchen. Then the condo opens up the expansive view of the gulf. Please check the reviews from guests of Boardwalk 703. Here are some features that guests like. The 30 ft. wall of floor to ceiling windows provides some of the most dramatic ocean views you've ever seen. Sun sets in full view of the balcony, as you enjoy a meal at the 40 inch table and 6 chairs. Early risers can see a sunrise to the east. Top of the line Simmoms Beautyrest plush firm mattress sets in MBR and guest bedroom. New sofa bed, two recliners, TV set, rain shower in master bath and new chairs on balcony were added recently. Beach friendly 7th floor. You have privacy but you can still hear the waves. Perfect for a family of four, but will sleep six with sofa bed. Heated zero edge pool and spa and kiddie pool. Master bedroom is spacious; approx. 14 x 15 ft. Plenty of space between bed and TV cabinet/dresser. Full length dressing mirror reflects a thin look. Crown molding. Open cabinet/dresser with 32 inch flat panel TV. Wake up to a direct view of the gulf. The main living area is also a wall of windows. Combine this expansive view with the 7th floor height, and you really feel a part of the beach and the emerald blue sea. At the north end, the view is to the Signal Hill golf course across the street. Very nice family owned 18 hole golf course. Pond and walking path also across street. Accessing this beautiful view is easy at Boardwalk. Pull up to the front door, and the five over sized elevators are just steps away. Unload and park on ground level, or one floor below in covered parking...your choice. When you're ready to explore, start with the dramatically beautiful lobby, gateway to the pool area. As you exit the lobby, landscaping frames a beautiful pool vista. A few steps down, and you're through the gated entrance. Seating is plentiful around the main pool, which is flanked by a kiddie pool and jacuzzi. Take a few steps and you're at the tiki bar, serving fresh food and drinks. Boardwalk is conveniently located in the middle beach area. Pineapple Willie's and Spinnaker are neighbors, and the Signal Hill golf course is across the street. Pier Park is about 10 minutes away via Front Beach Rd, Middle Beach or 98. Amenities Summary: Free cable tv, two late model 32 inch LCD tvs and a new 43 inch tv in living area. Free pool side lounge chairs, matching deck chairs, 50 inch tables and umbrellas. Free beach chairs in the condo to take to the beach. Matching set of four chairs with beverage holders and a commercial grade 9 ft. umbrella. Take them right down to waters edge! Covered parking plus top deck right in front. Gated security and security personnel 24-7. Five large elevators with ceramic tile floors. Large pool area with many amenities. I'm Stan Hansen, living in Dallas, TX, pictured here with new wife Susan. I grew up in Iowa, and somehow developed a life long love of the beach and ocean. I've been in marketing all my life, and believe in customer service. What that means to you is that I want you to enjoy your stay in my condo, and want to hear from you if you need anything. Good or bad, feedback helps me provide a better guest experience. I like Panama City Beach because it has such varied attractions. If you like fun and funky, there's plenty of that. If you like the upscale side of life, you can find that here. I love to eat on the water, and there are tons of good water front restaurants in PCB. I also enjoy picking up a meal to go, and heading for the balcony table to enjoy a meal with 180 degree views of the pool, beach and gulf. I chose the Boardwalk because it has exceptional amenities, they really keep it clean, and they have friendly and helpful security people on deck. Boardwalk is also a gated resort, and they have on-site chair rental and service. The combination of the beach friendly 7th floor, and panoramic view from the master bedroom caused me to think 'this is it', and I bought it that day. The large bump out balcony with 180 degree views of the gulf was also a factor. Ideal for lunches with a view or sunset watching. Management of the resort is by an HOA selected group and security are also exemplary. The close in parking, golf course across the street, and renovated boulevard are unique to this property. Last year I decided not to use a rental agency any longer. Therefore, you can go right to the door and just punch in a code. I'm available any time, and can fix any problems with no delay. For example, last week I had a problem with a refrigerator not cooling. I bought a new one on a Sunday, and had it delivered on a Monday holiday. I also have a housekeeper who is dedicated to this unit, and cares about keeping it clean. I have my own sheets and towels, not generic ones that may be getting a little tired. If anything is not right, it will be promptly fixed. Guest bedroom sports new 32 inch lcd tv. Window to north overlooks Signal Hill golf course. Adjacent bathroom opens to guest bedroom, and also to the hall from a second door. Tub/shower combination. Sink vanity with medicine cabinet. The Boadwalk has one of the deeper beaches along the PCB coast. Beautiful while sand. Direct, straight ahead view expanding to 180. Great sunsets to the West. Signal Hill public golf course is directly across the street, and can be viewed from the front of the condo. Gulf on the south side, golf on the north! Property is ocean front, with straight ahead views of the pool area, tiki hut, beach and the gulf. Cable tv, with HBO and many other stations, provides great reception via two 32 inch lcd tv's and a new Samsung 43 inch tv in living area. 40 inch dining table with 6 chairs on large balcony. Dining table with 4 chairs inside. My husband and I were due to travel to New Orleans on Saturday 27th October, travelling across to stay in #703 for a week from Monday 29th October in time for the Ironman Florida event. We had been careful in selecting our accommodation so that it was close to the start and finish of the race. From the time of booking, the owner, Stan, was in contact wanting to know a little about us, and our group, and telling us about #703. He was friendly and helpful without being intrusive. Stan kept us up to date with renovation work being undertaken on the outside of the building, advising that we could cancel our booing at any time if we thought the work might affect our stay. I really loved this open and honest approach. Having been in Chattanooga in September 2017 during Hurricane Irma and seeing the devastation caused in the Florida Keys, my husband and I were slightly anxious when Hurricane Michael materialised. Throughout its journey Stan kept us up to date with what he knew about its impact, again advising that whilst he would suggest caution until we knew where it was headed, we could cancel our trip at any time for a FULL refund. Again his honesty and generosity were incredible. To cut a long story short, although #703 was not damaged in Hurricane Michael, the Ironman Brand quite rightly made the decision that to hold an event in an area where people had lost everything and were struggling to rebuild their lives would have been insensitive, and they cancelled the event. In view of this we made the decision not to take our holiday in Panama City beach, fearing it would seem insensitive to be holidaying in a place which had lost so much, whilst we were not affected. We cancelled our much looked forward to stay in #703. We have been a FULL refund, and I cannot thank the owner Stan for his openness, generosity and kindness at what is a difficult time for Panama City Beach and the local area. I would highly recommend this owner as being open, honest, helpful and quite rightly proud of #703, and we are already trying to work out when we can return to stay at this wonderful place. An extra benefit of owning a condo is that you get to meet interesting and really nice people. I had looked forward to meeting these guests, as I admire an ultra competitive athlete who would tackle an Ironman. The personal hello didn't happen, but I really enjoyed talking with our gracious and civil neighbors from England. Awesome owner! Very well maintained property!!! Stan has always been great to rent from. This was our second year and we are already planning next years visit. His condo is always very well maintained and clean. Initially I thought this guest meant "awesome view" but as I read further I found he was talking about me. Thank you. I think the comment originated from providing excellent customer service and doing everything in my power to have a condo that is clean and well equipped. Well stocked, family friendly, and comes with chair service! I have to say out of all the condos I’ve stayed in this is the most well stocked. Enough towels, utensils, and dishes that we didn’t have to worry about constantly washing. And best of al it comes with chair service, no need to take chairs or umbrella to the beach. This resort is very family friendly with constant security in parking lot and in pool area, and they are very vigilant no one got by with breaking the rules but also very friendly even giving all the kids popsicles one day by the pool! I would definitely return if visiting PCB. We strive to make a guest's trip stress free from annoyances, and recognize that a guest has a right to expect all the things they need, in place. Security is a definite plus for this resort; friendly and helpful but in control. Unit 703 was a wonderful home away from home. The beds are very comfortable and it is rare to have recliners in the living room. The owner was very responsive to any questions or needs. Thank you. The twin recliners allow guests to view both the gulf and the new Samsung smart TV set. I also strive for a clean, comfortable and homey feel. Home on the beach! Always happy to hear 703 and the property met the guest's most important expectations. This guest stayed in November, a beautiful month at value prices. What a kind review! It's nice to be in a position to do a favor for a great return guest just because it's the right thing to do, instead of the most lucrative thing to do. Boardwalk is ideally located within 1 to 5 miles of many of the popular big box stores, plus dozens of specialty shops at Pier Park. Publix, Lowe's, Target, Wal-Mart, Dillards, JCP, Home Depot are all here, and convenient to Boardwalk. Signal Hill golf course across street. Step out to the gulf in the front, and all the retail and cars disappear behind you. You are on one of the world's most beautiful beaches. Contact owner for custom quote if your dates are between seasons. Spring breakers must be 25 plus. Rental term is Saturday arrive and Saturday leave. Cancellation policy...no cancellations at 30 days or sooner from reservation date unless medical emergency. Flat rate refers to a fixed number of days, usually for an event or holiday, and usually 7 nights. Iron Man arrive and depart 7 nights are flexible by a day or two. Rates..rates above are net to owner. Please inquire about the property to get all fees such as taxes and cleaning, customized for the time and week or weeks of your interest.